What is the Best Method For Building A Small Cabin Foundation? On a scale of 1 – 10: How critical do you think the cabin foundation is? Let’s just come right out and be clear that the foundation is easily THE MOST important phase of your off grid build. Today we’ll cover how we built the foundation as well as the reasons we went with this particular design. 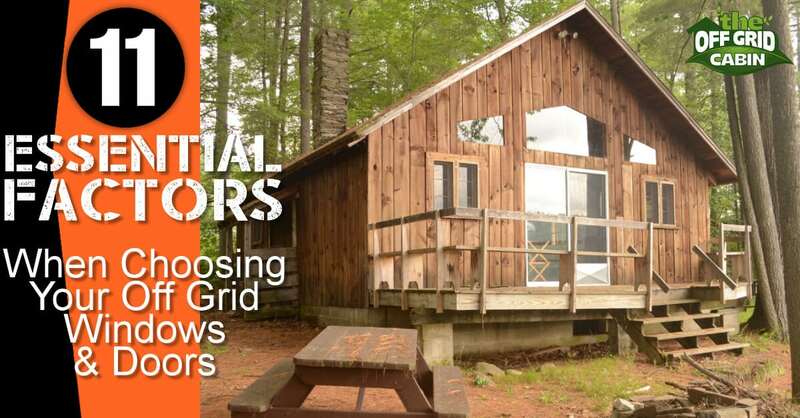 If you’re new to The Off Grid Cabin then welcome aboard the adventure as we build our very or solar powered home off grid in Nova Scotia Canada. 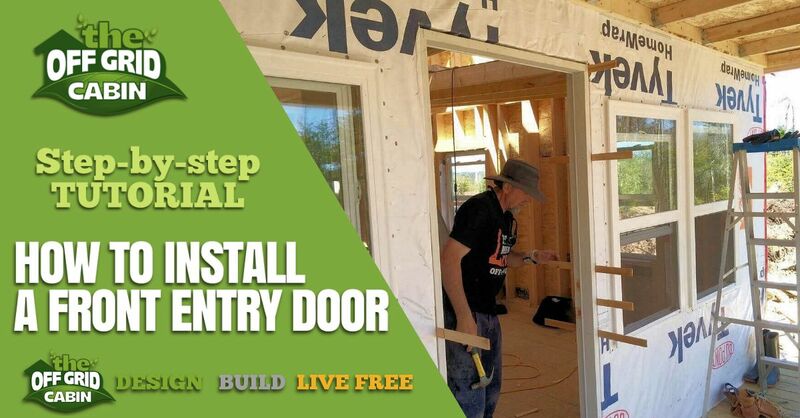 We’re sharing every step of this one of a kind build with you as well as a host of other off grid goodies! Want a complete cost breakdown of our 24ft x 20ft off grid home including the building materials list? SEND ME THE COMPLETE PACKAGE! Enjoy the adventure and hey… if you found it fun, informative, or entertaining be sure to help us out by sharing this post with your social media peeps or this Pinterest Pin! 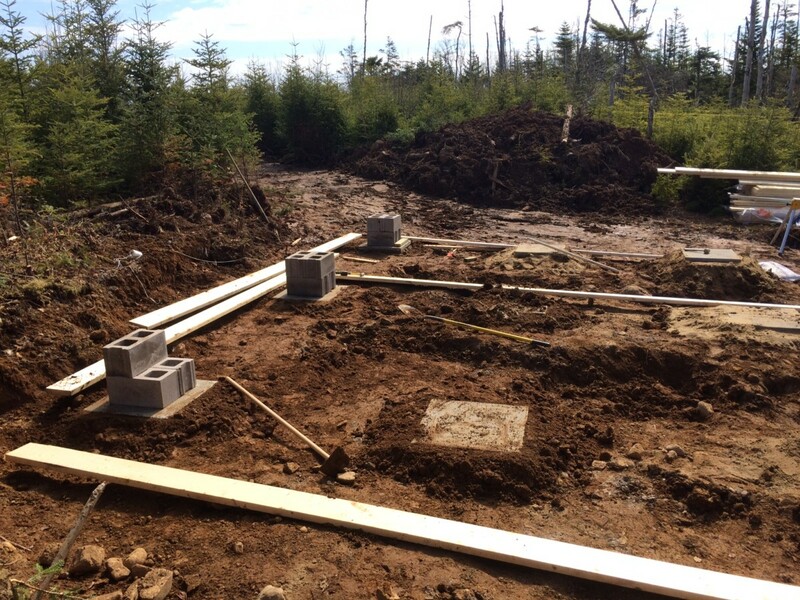 There are several different foundation designs we’ve seen used for off grid homes. They range from simple footing and pier designs like ours al the way to fully poured concrete basements or crawl spaces. Here is a look at several different foundation designs ranging from simple to complex. There are pros and cons to each of the foundation designs. However, it came down to four factors that determined our choice. Our foundation design is both incredibly economical and effective at creating a rock solid building platform. It is especially easy to build in an off grid location and with a limited crew. Mostly it was just my Dad and I. Heavy machinery is expensive to bring in and the soil type may not always conducive to you building a fully dug out basement. A poured foundation, or even a cement pad, can cost thousands and take weeks to build. Again, a cement truck may not even be able to access your build site. They certainly couldn’t on ours. Our foundation was simple to design and quick to build. 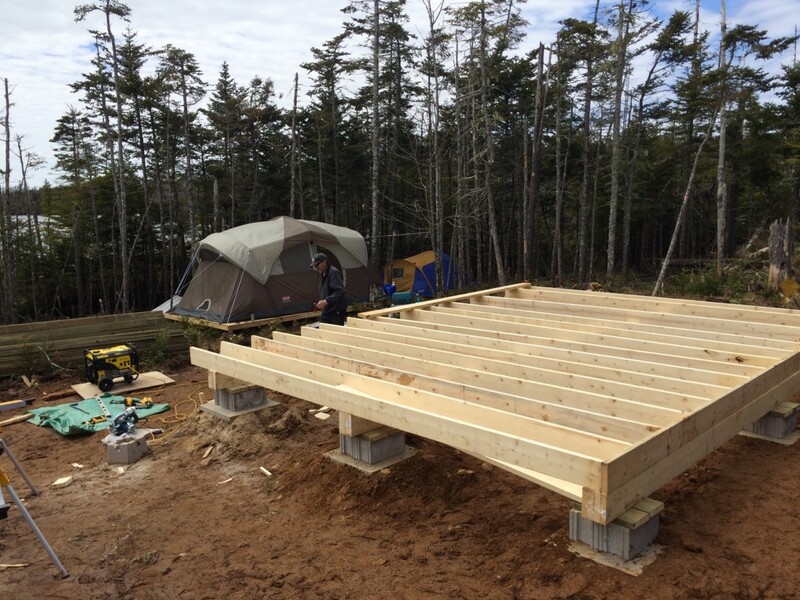 TIP: Our floor design (1″ rigid foam core sandwiched between 3/4″ PT plywood) provides an excellent thermal break from the cold harsh winters of Nova Scotia and creates a strong and rigid building platform. When built properly, your foundation will easily last the lifetime of the cabin and most importantly, will allow you to keep your off grid home level and rock solid always. Previously we began to lay out the footings to prepare for what lay ahead today. 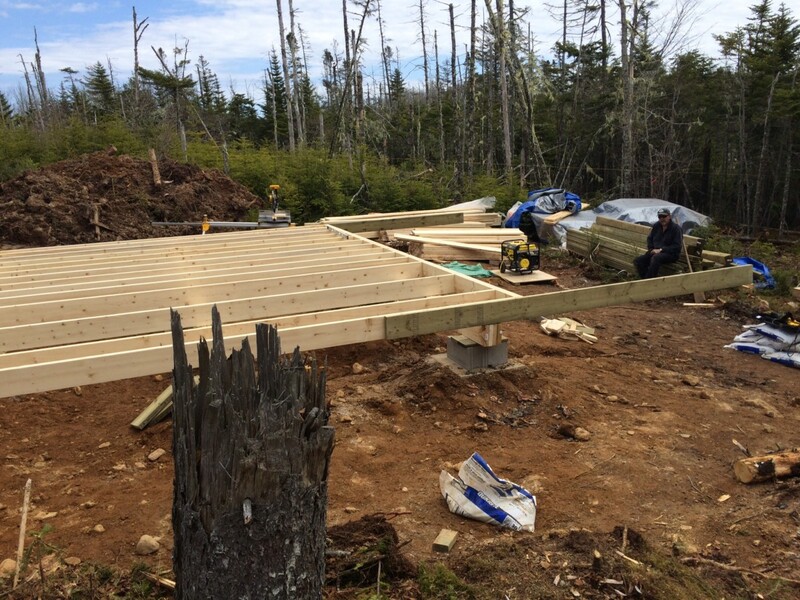 Today we finish installing those footings, build the main support beams, and begin to frame the floor joist. All this will finally give us a good idea of just how cozy our off grid home is going to be. We leveled 12 spots on undisturbed soil using 2 bags each of crusher dust where the 24″ X 24″ cement pads will be placed. On top of those cement pads we’ll place 8″ cinder blocks side by side and place the main support beams on top of a piece of pressure treated spacer. TIP: Never directly contact wood that is not pressure treated with the concrete or cement blocks/pads. The moisture from the concrete can be drawn up into the wood, and after a period of time the wood will rot. You can maintain separation using PT spacers like we did or use an appropriate gasket made from soft plastic or foam. Initially we used 4 cinder blocks on each pad (2 on top of 2) but we found that was a little too high to our liking. 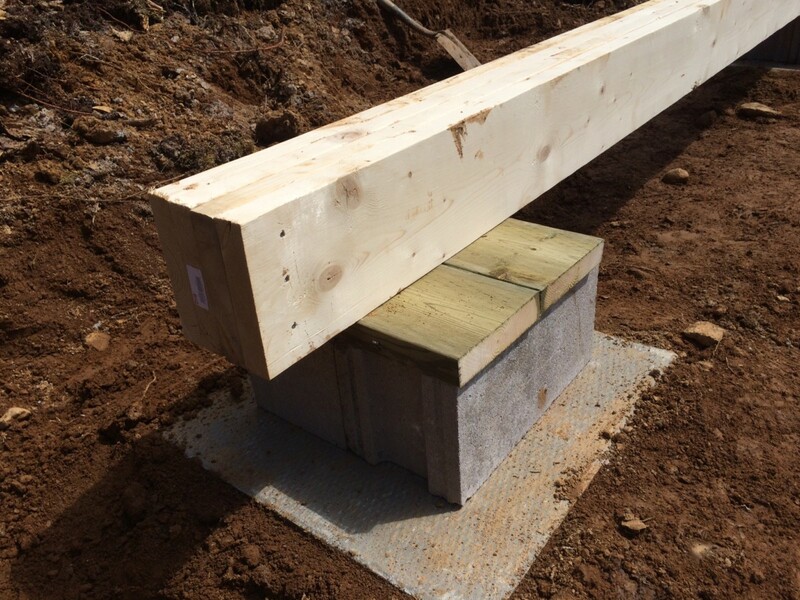 Getting the ground perfectly level is critical in ensuring the remainder of the structure is level, won’t shift, and allows for every beam, board and joist to line up perfectly. My Wife helping level out the ground. The whole family worked together to build our cabin. Below: Laying out some lumber scabs to ensure the pads are all the same height. Below: Here’s a panoramic view of our build site. 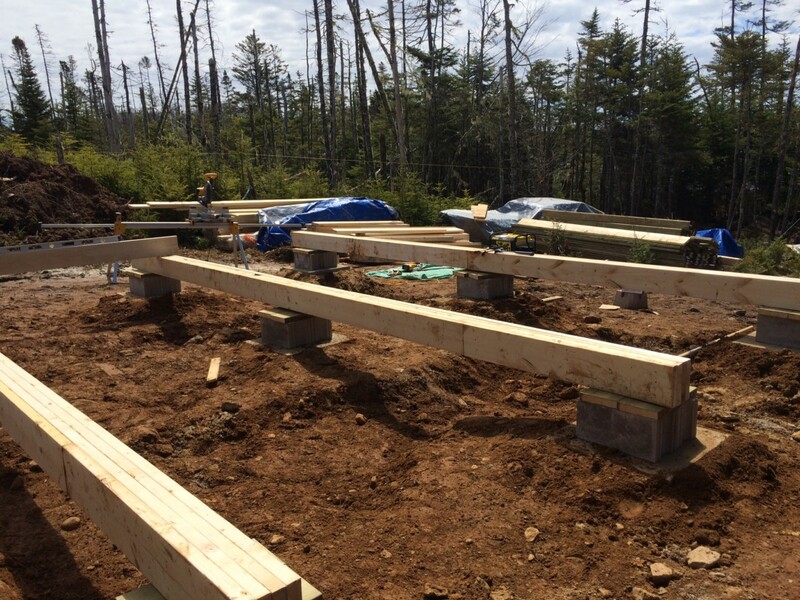 We used 16ft long 2×8’s quadruped up to make up the three main beams that will support the floor joist. To fashion the beams we over lapped the 2×8’s making sure to use construction adhesive and nails the full length of the beam. When we had two layers built we simply overlapped another row of 2×8’s and repeated the process until we had four layers. TIP: We used DAP Subfloor Construction Adhesive whenever we needed to build our beams or put down subfloor. One can of this expanding foam is equal to 8 tubes of regular construction adhesive! 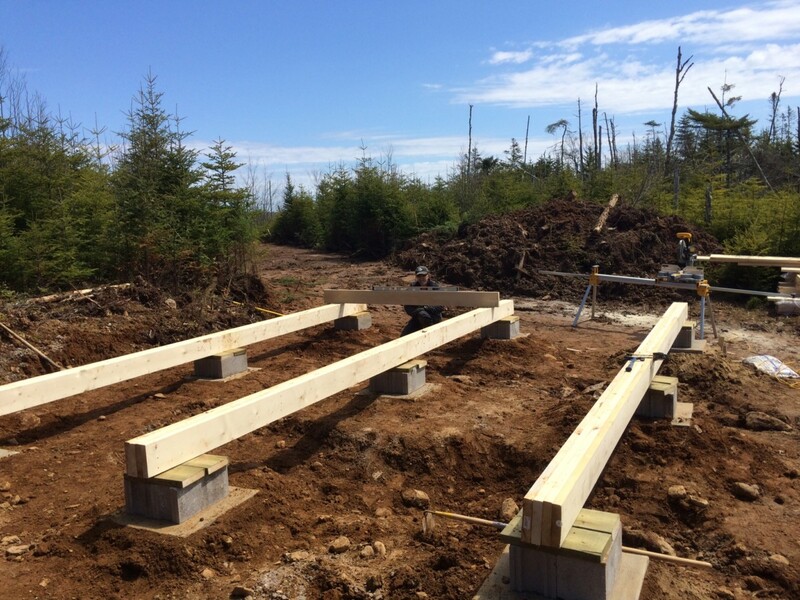 Below: These are the 9 footings that will support the three main support beams. Each of the three main support beams are free floating on their respective cement block without anchoring them down. This allows for the footing to shift (with the change in seasonal temps) “if” that happens at all. If the beam was anchored to the footing, and one footing was to shift, the cabin could experience a shearing force and may cause a weak point in the footing and/or structure. By allowing the beam to ride on-top of the cement footing the entire building can slide on the foundation to prevent unwanted forced from occurring. Now to be 100% clear when I say “shift” or “slide” I’m talking millimeters here. Please do not misread that and think your home will be sliding around like skates on ice! Our cabin foundation hasn’t moved whatsoever over the past three years. That’s going from +30 in the summer to -30 in the winter and being built on our gravel/soil foundation. Without a doubt THE BEST single purchase we had before tackling this build was this Dewalt Cordless Framing Nailer. You’ll hear me go on and on about this one tool throughout the build but I honestly cannot give it enough praise. You may wonder why we would spend the money on something like this when we could have just used a goodl old hammer and nails? It was a massive time saver, shaving days off the overall build, and allowed us to nail in places we just would not have been able to swing a hammer. 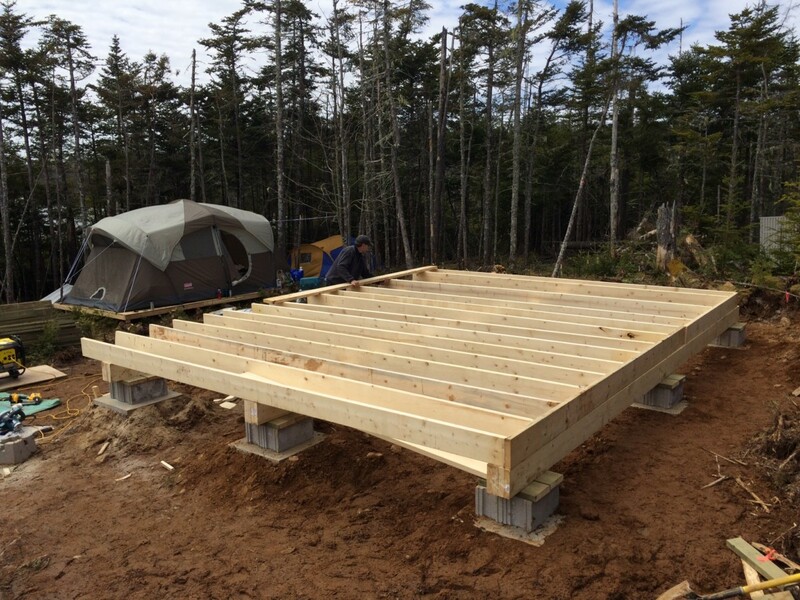 3 more pads will be placed between the floor joist and the tent in order to support the 3 – 6″x6″ PT Posts for the front deck. You can see we reduced the height by one cinder block on each pad and separated the beams from the cement with a few pieces of pressure treated wood. 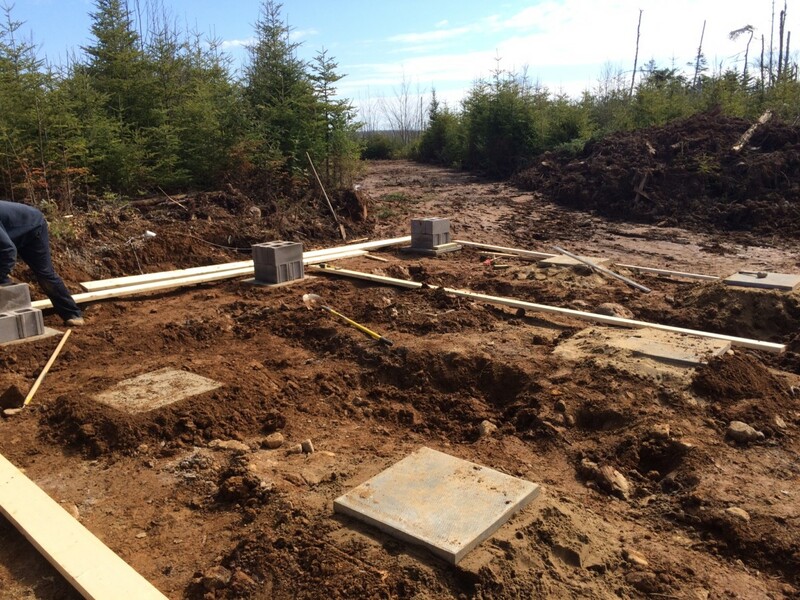 Bellow: These are the footings we will use for the three 3 – 6″x6″ PT Posts that will support the front deck. We used 2×6’s 16″ on center for the floor joist and we will top the floor with 3/4″ tongue and groove OSB. On top of that we will put down 1″ think ridgid Pink Styrofoam to act as a thermal break and then top that with more 1/2″ OSB. Completed the basic framing for the floor joist. The pressure treated beams give a sneak peek at the size of that patio. 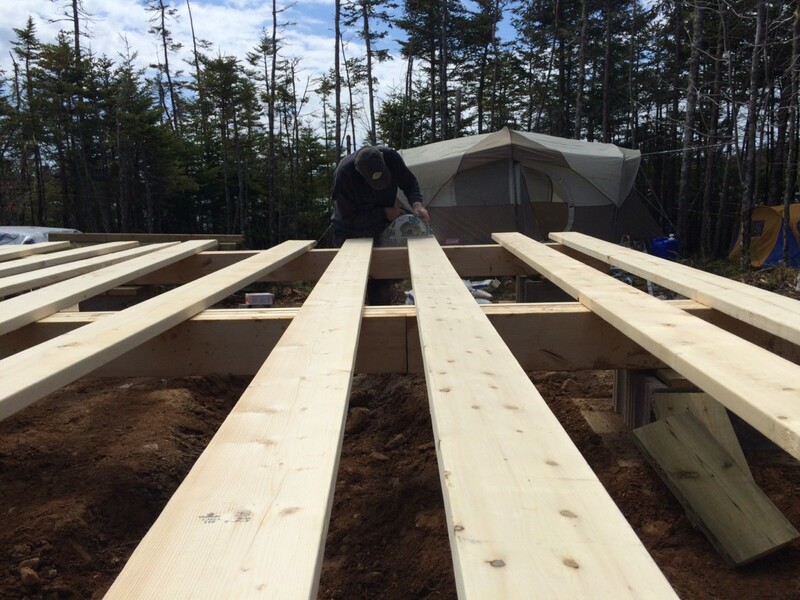 The front deck will be 20′ x 8′ and use 3 – 6″ x 6″ posts used to support the front edge of the deck roof. 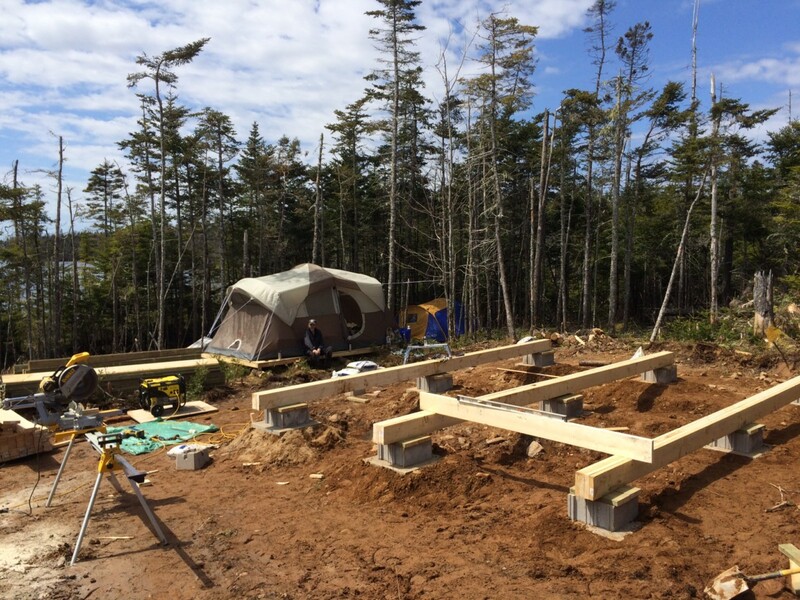 Today we finished up the footings, the three main support beams, and began to frame the floor joist. Finally we get a good idea of the floor space we’ll have and how cozy our 20′ x 24′ cabin might feel like. 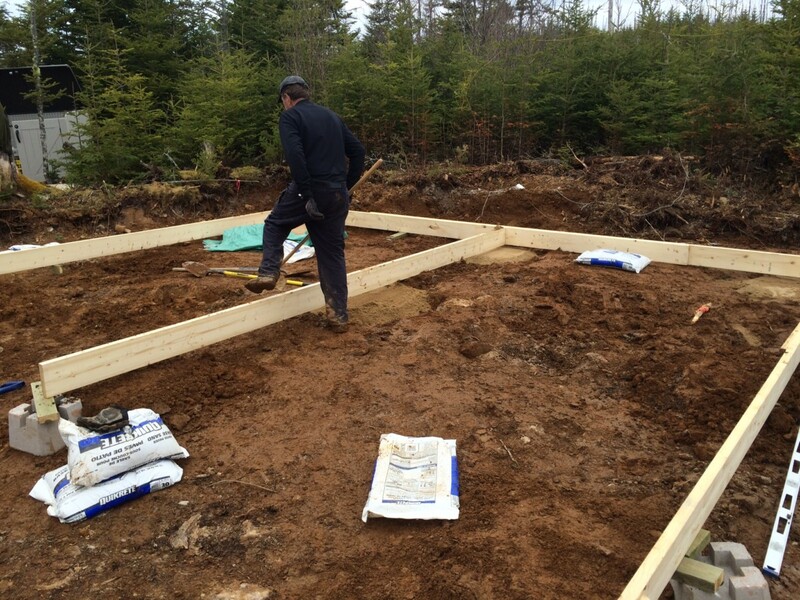 In our opinion, this is by far the best method for building a small cabin foundation with our soil type, climate and location. While each off grid build situation is different remember there are several general considerations when building the foundation for your home. 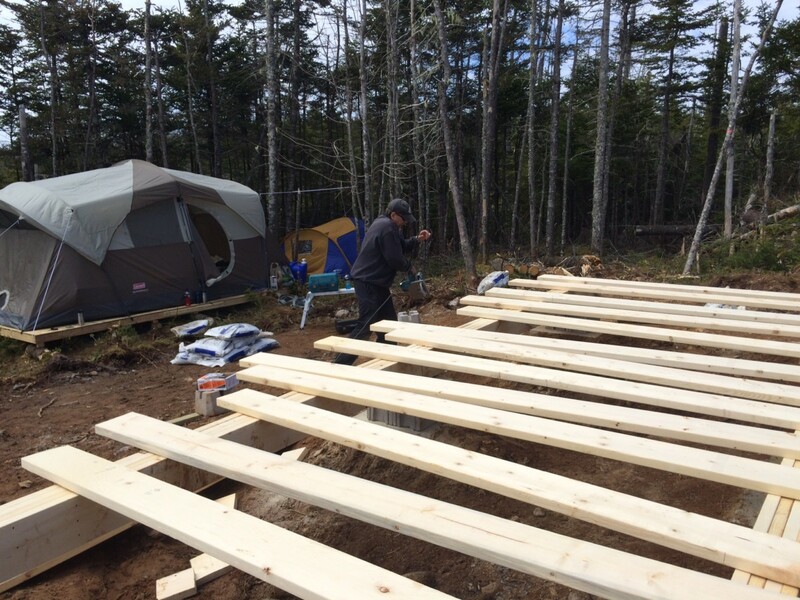 Next time we finish up the floor joist, put in the 3 – 6″x6″ pressure treated front deck posts, and ensure the entire foundation is level and square before we put down the first layer of OSB. If you haven’t yet SUBSCRIBE and follow the entire journey! 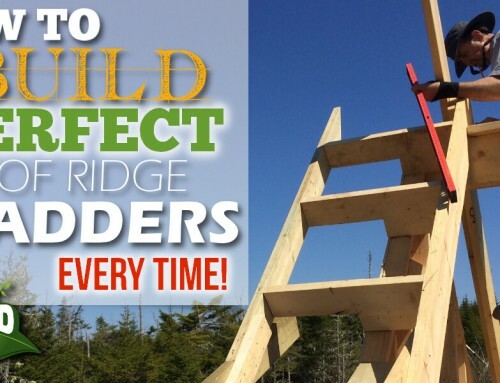 Are you ready to tackle your own off grid foundation? Let us know in the comments below if you are to if you have. And for our Pinterest followers here’s your pinnable pin! Ready To Check Out Tomorrows Build? 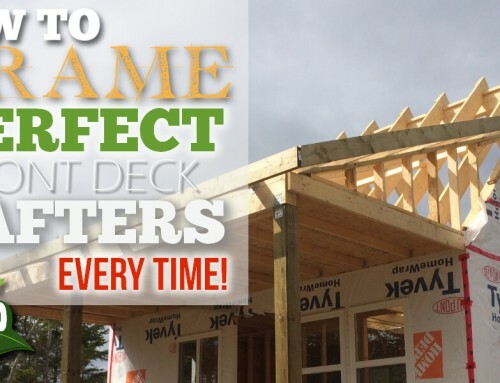 How To Build The Perfect Front Deck! SHOW ME THE NEXT POST! After being physically and mentally disabled by cancer a highly decorated Air force helicopter pilot overcame the odds to regain his health and began an off grid odyssey that has helped change the lives of thousands. During his recovery he launched The Off Grid Cabin and today over 1 million people have seen his posts and read his blog every month. Read Steve’s inspirational comeback story here. What is the frost depth in your area?? You mite of used sono-tubes with rebar. Did you check cross angle of the box frame?? Suggest you use foil-buble-wrap over the 3/4 OSB sub flooring, the pink insulation attracts ants and other critters. If the flooring will be exposed to the weather for a wile, use driveway sealer to roll on top of the OSB, so it don’t swell up from rain. Use strapping to anchor the walls to the outer box sill, and brackets on the top plate of the walls to the roof rafters. Good Luck. Hey there Mike! Thanks for taking the time to comment and share your expertise. 1. Time: We had only a 2 week period to build the cabin from start to finish and went with the fastest method that was still safe, effective and proven. Digging holes, mixing concrete and waiting for it to set would take days we did not have. 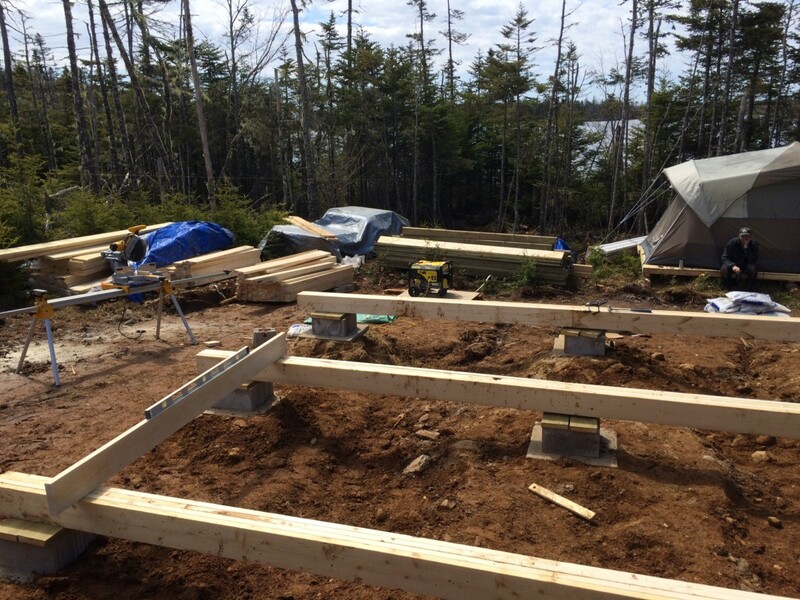 We had all the building material dropped off the same day the build site was stripped by excavator and the 14 day clock to get the entire cabin framed, closed in and weather proof was started. 2. Location: We had the excavator for one day only in order to clear the land then it was gone (partly because of the load restrictions on the roads here in winter, partly because it was needed elsewhere, partly for cost reasons). The rocks underground where we are located are massive granite boulders (and without that excavator, it would not be possible to move them by hand along or by using post-hole diggers. An 8 cubic foot boulder (2ft x 2ft x 2ft) weighs 1200lbs. A boulder 27 cubic foot weighs 4320lbs! Unfortunately that’s exactly what we have right here. 3. Cost: We were able to save the cost of the tubes, footings, heavy equipment, and concrete putting those expenses into other parts of the build. 4. Ease: Honestly, it took a morning to get everything squared away and level and we were building. My father used to build houses in Pangnirtung Nunavut and this is how they did it then. Those homes are still there 50 year later. The pink foam is sandwiched between two layers of plywood and end capped all the way around. I think you’ll see the use of the top plate brackets in the following posts on rafters. We also used hurricane ties up top even though that’s total over kill where we are. The next cabin we build there will be far less time constraints, now that I’m retired, and I would consider using sono-tubes and concrete to compare the process. Thanks again for chiming in Mike!! Thanks for posting. I am not judging you, just making comparisons to what I have researched thus far for my future build. I too was wondering why you didn’t use tubes with rebar. It looks like you have plenty of water near by to mix your pour. I am curious though…what is anchoring the cabin to the ground? Hey, I actually just replied to Mike’s comment re the same sort of thing here. I hope that explains exactly why we built our foundation the way we did and if you have any more questions at all please fire away. Thanks for asking your questions Andrew and we’re thrilled you are doing research BEFORE moving ahead. I’ve gotten too many emails and comments from people saying they started… and “Now what?” Good on you! Great to hear you’re building an off grid cabin as well. Yes you can definitely use this method in harsh winter environments. In fact, our cabin is located less than 1Km from the Atlantic Ocean coastline and we get some bitter cold winds hitting us quite frequently. Provided you have good insulation and heat source, we find the wood-foam-wood thermal break works very well. We also laid down a hardwood floor (from Costco) that probably doesn’t contribute to the insulation factor much but helps retain the heat once the cabin is at a good temperature. The “ONLY” issue we’ve experienced (our fault) was when we left a memory foam mattress directly on the floor while we were gone (and the heat off). When we came back and heated up the cabin, we forgot to lift the mattress off the floor and the temperature change created humidity between the mattress and the floor. Nothing major but a point to remember. Now we’re installing a Murphy bed to prevent such an issue in the future and to save space. I lived in Portage La Prairie 2004 when I first began my military flying career and again from 2009-2010 while attending helicopter flight training. I can definitely vouch for those frigid winters on the prairies! Best of luck with the cabin and do keep us in the loop as you progress! What kind brand footings did you use? I am finding it hard to fins any footings that will take a 6×6. Thanks! The choice of using a footer trench depends primarily on the ground type, how level it is (0…10… 20… 30 degree slope), availability and cost of related materials, and whether you intend to hire a professional building service contractor or to do it the work yourself. If you hire a professional building service contractor, your choice of foundation options are fairly wide. 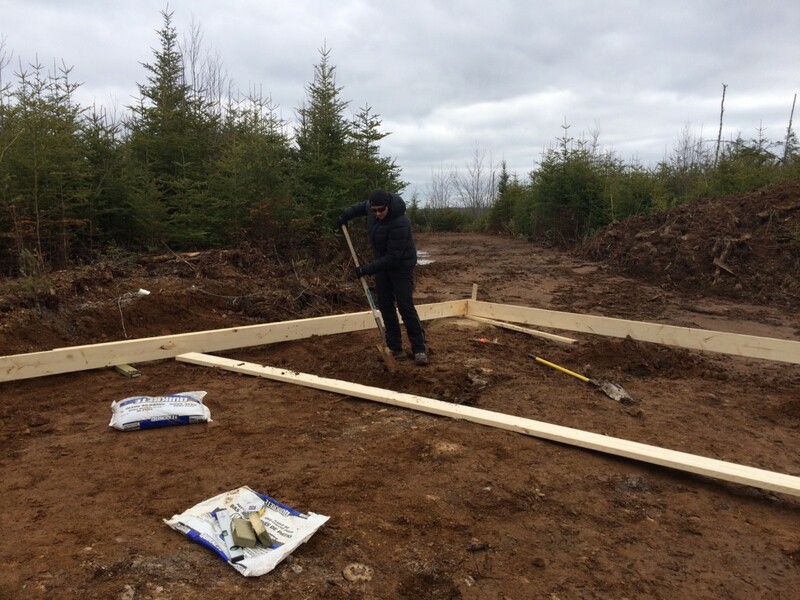 You’ll find out MORE about our specific foundation type here..
-If the ground is rocky OR there are a lot of tree roots underground, digging holes (for posts) may be a problem. -If the ground has a small slope, you may be able to compensate with different-sized, or additional blocks, or raise the ground level on one side by laying gravel. -If the ground has a fairly steep slope, you will need to use posts or raise a wall from concrete blocks on low-level side. -Make sure any gravel is well compressed. Otherwise it will settle later and skew your cabin structure. 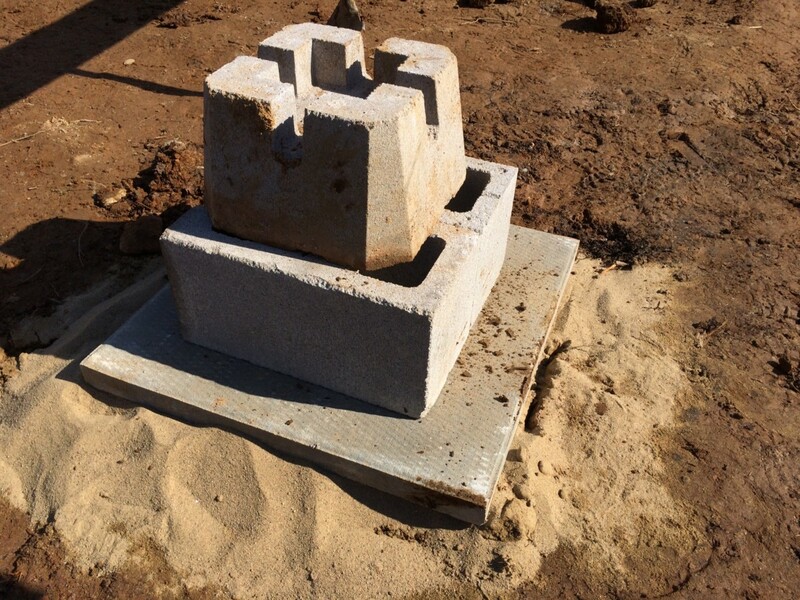 -One of the advantages of using concrete blocks is that over time, some blocks may settle more than others. This can be fixed by slightly lifting one side of the cabin with a car jack and shimming the blocks with flat stone, ceramic tile, etc. -If using posts, they normally should be dug into the ground deep enough to firmly hold their load and below the freezing level. The freezing level depends on your geographical zone. Generally, you should dig the post at least 4 ft deep. 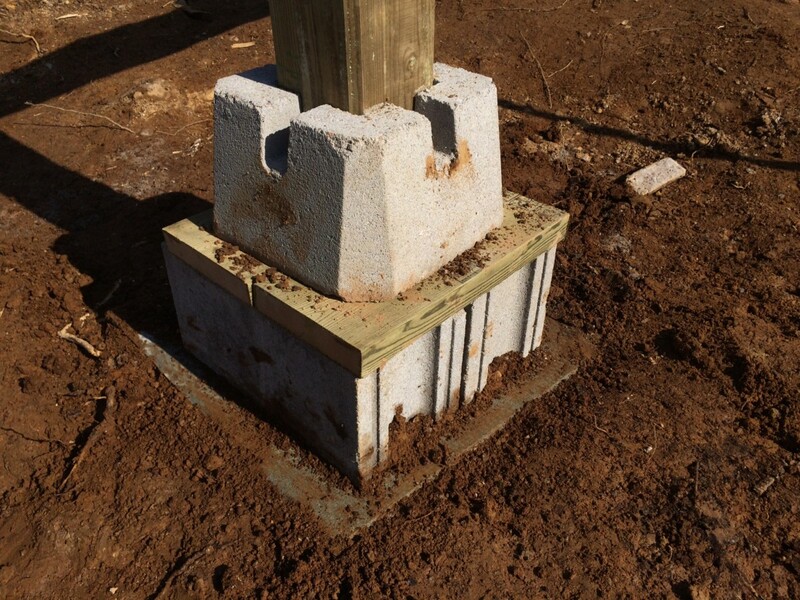 -If pillars or posts are not dug deep enough (i.e., above the frost line), this may cause warping or movement within the structure over time as moisture in the ground freezes and thaws. 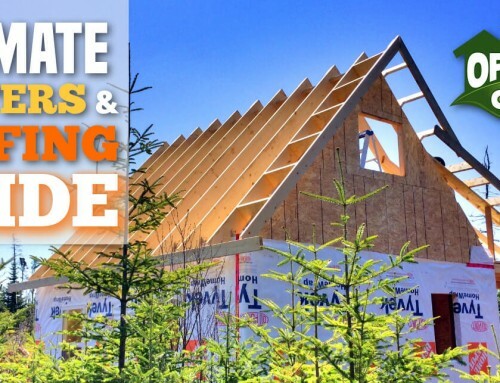 Cabin structure warping can lead to cracked windows, skewed doors, etc. -If a post cannot be dug into the ground, another option is to place it into a concrete footing or a concrete (deck) block. However – very important – this can only be done on some (1 or 2) support points. Posts that are not secured deeply will not withstand horizontal forces. Other supports points (posts/blocks) that can withstand these forces must be firmly mounted. 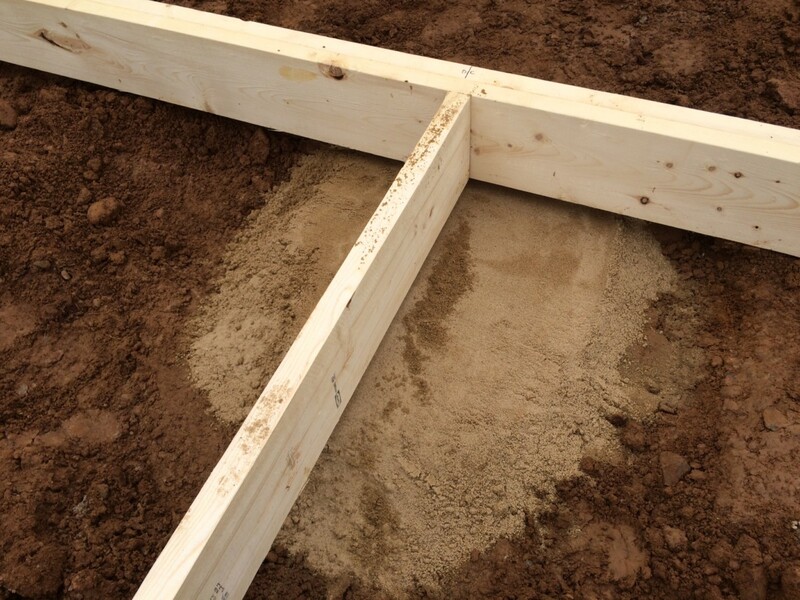 -When placing posts into the ground, it is recommended to use concrete footing, at least in the top half. Sono tubes are supposed to be even better options, but they require more concrete, are more labor-intensive and cost more money as a result. -Poured concrete is an applicable option only on a well-leveled ground. However, it is also a more expensive and more labor-intensive option. -For posts you can use prefabricated pressure-treated 4″x4″ or 6″x6″ posts, or wooden posts formed using tree trunks. (You can paint them with oil paint first for better protection). Sometimes the best option is to place the entire structure on a set of two double support beams (sometimes called girders). This is especially useful on unlevel ground, when used in conjunction with posts. 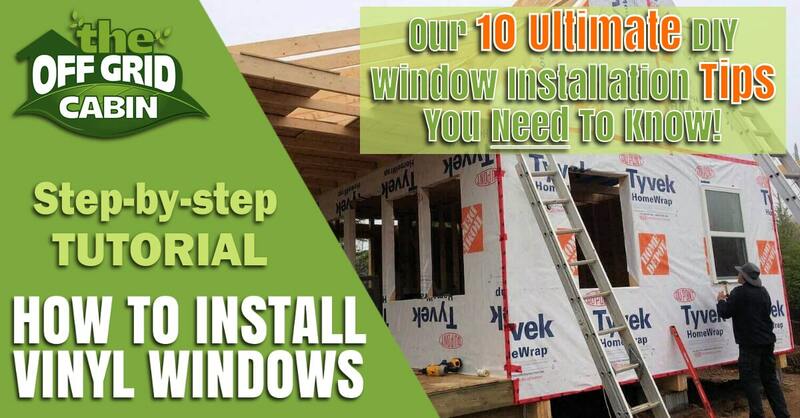 Use two (or more) double-sets of 2″x10″ or 2″x12″ beams. (Keep in mind that beams add height to the cabin floor – your small cabin will look and feel “raised”). Hope this helps you a bit in your planning. Feel free to ask any more questions along the way! Gents, great info for an amateur building a small cabin in the Maine Woods! Starting at the beginning of this series of notes, I was wondering how the 2×6 floor joists are secured to the 3 quad beams that form the base of the foundation…is it by weight/gravity, or are there straps that are used to keep the joist frame securely in place over the 3 quad beams? Hey Mike, just wanted to get back with you regarding the floor joist set-up in case you didn’t catch in future posts. The entire system is a floating design. Because we didn’t go with a traditional solid foundation (concrete pier) or a concrete slab/crawlspace/basement the footings will shift “minimally” with changes in seasonal temps. With the joists “floating” on the beams this allows us to shim the individual sections that “may” require it as the building settles over time. I’m going to write up a post showing how I check for lever each spring/fall and how I level each pad if required. It’s incredibly simple, quick and effective. Where’s the rest of the cabin build at? Hello Steve, can you please confirm a few things regarding the floor. In some photos it seems the floor overhangs the main beams at front and rear of cabin but in others they seem flush to the edge of the floor. If the floor does over hang the beams, by how much. If you didn’t do this than I assume the cinder blocks at front and rear will be in the way when skirting the cabin and I will have to work around them ? I do notice the cinder blocks are inset on left and right sides which means no going around them when installing the skirt. In short, the easiest way to put this is are the main beams 16 feet apart, outer edge to outer edge ? 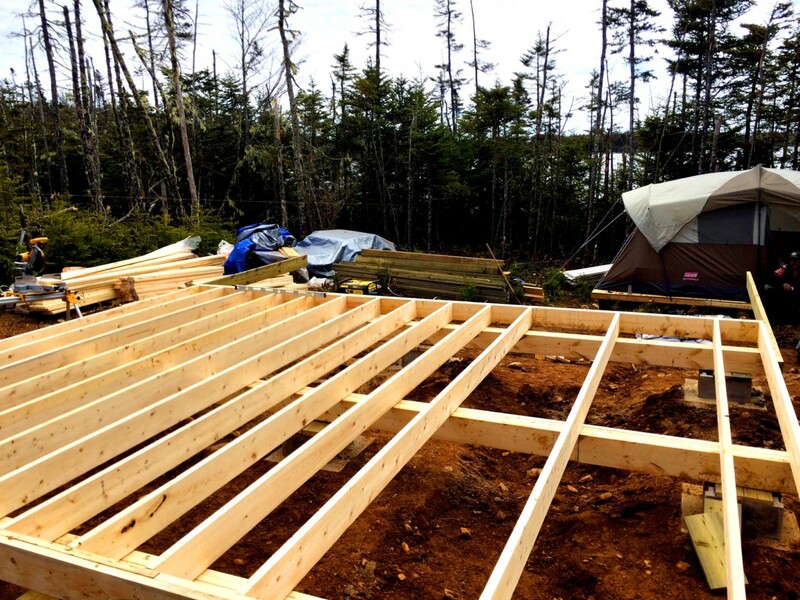 The floor joists are flush on both sides and the rear. The only side that isn’t flush (yet) is the front. 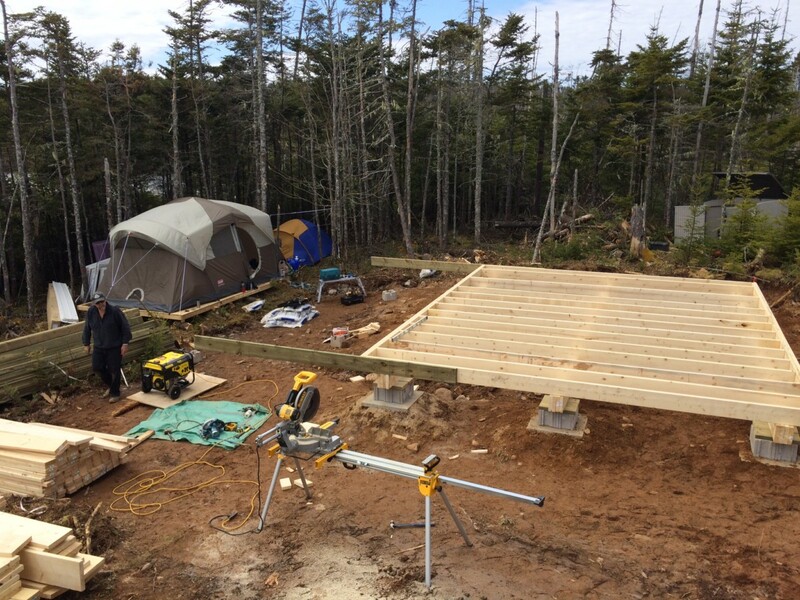 In the next post you’ll see that’s because we’re building an 8′ x 20′ covered front deck and we’ll be using 3 6″x6″ chamfered pressure treated posts to support the front of the cabin deck instead of the footing style we used for the main cabin section. We won’t be skirting around the cabin for a few reasons. 1. To allow air to better circulate underneath the cabin. This helps keep the ground dry as we’re on a slight slope and rain “may” run underneath. 2. 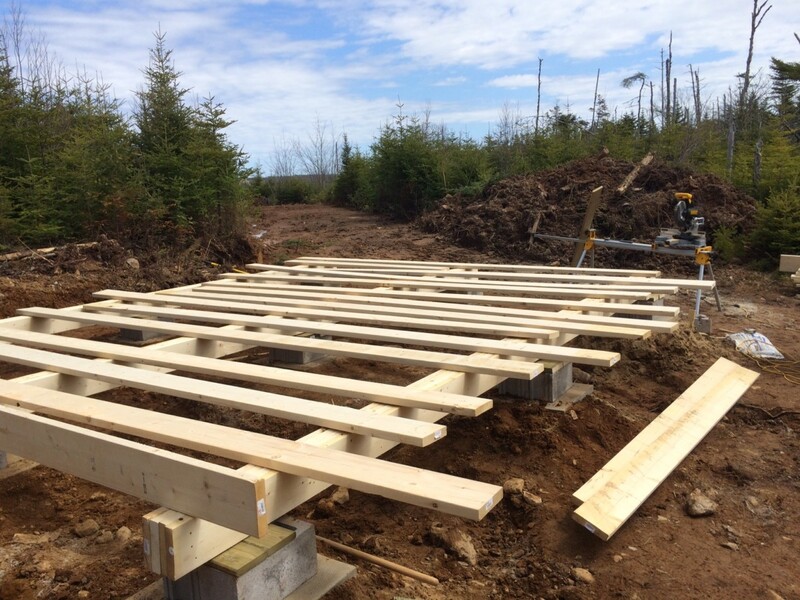 It allows us to easily shim the cabin footings in the future if we find any one (or more) footings have lowered due to settling. And access the propane/water lines. 3. We also want to store our kayaks/paddle boats and firewood under the front deck and not have to try and squeeze them (or us) through a 3 foot tall door way. 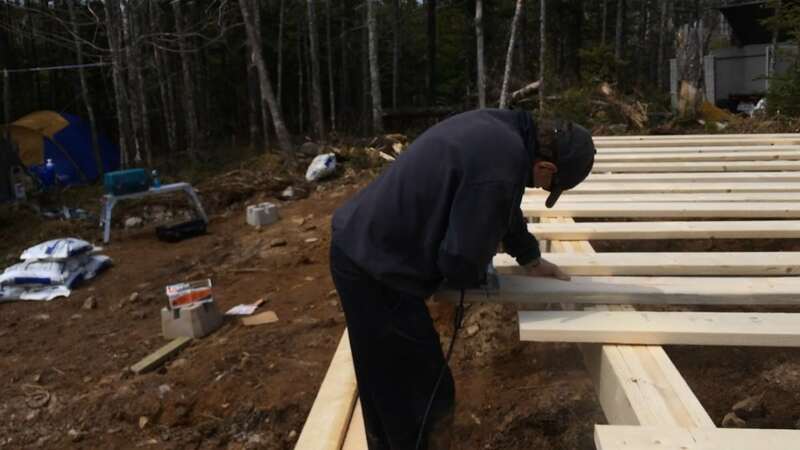 If your build calls for skirting around the bottom then you could simply move the footings in one floor joist, shorten the 3 main support beams a little, and that would work. I have been day dreaming for years about building my off grid cabin myself. i found your site and it’s been a great resource (for the day dreaming still) . 1. How did you joind the 4 2×8″ beams? Nails, Screws only or should I use glue as well? Each of the three main support beams are free floating on their respective cement block without anchoring them down. This allows for the footing to shift (with the change in seasonal temps) “if” that happens at all. If the beam was anchored to the footing, and one footing was to shift, the cabin could experience a shearing force and may cause a weak point in the footing and/or structure. By allowing the beam to ride on-top of the cement footing the entire building can slide on the foundation to prevent unwanted forced from occurring. Now to be 100% clear when I say “shift” or “slide” I’m talking millimeters here. Please do not misread that and think your home will be sliding around like skates on ice! Our cabin foundation for example, which was built in April 2015 (it’s currently Oct 2018), has not moved what so ever over the past three years. That’s going from +30 in the summer to -30 in the winter and being built on a gravel/soil foundation. Hope that helps answer those questions Karben. So glad to hear you found it helpful Karben! Steve, I am curious, did you purchase pre-made pads or make forms and pour your 24×24″ concrete pads beneath the cinder blocks? It appears to be a pre-made piece, but thought I would ask. Soon I will be starting my own cabin adventure in the southeastern US and want all the info I can get! We actually picked up the pads from Home Depot. They call them a Patio Slab Paver and are less than $10 a piece. Here’s the link for them at Home Depot so you can see exactly what I’m talking about. 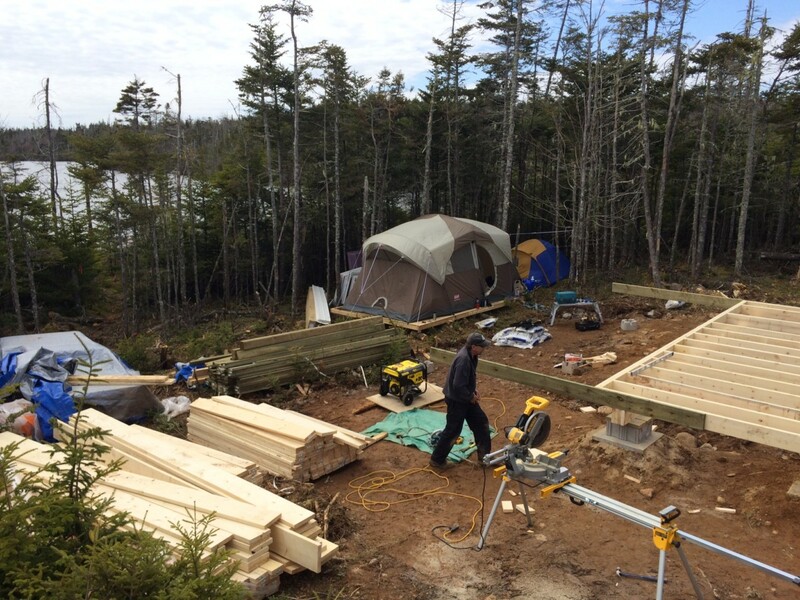 Definitely share your cabin build process with us when you get started Patrick! Wow! Your style of sharing your build with us is capturing as in the first page of a book determining whether you go to page two. Your “book” makes one want to go at a slow absorbing pace..a question that I would be interested in the process of the sand and crusher dust and exactly how you leveled all the points of the foundation….thanks! Well, once we dug down to “undisturbed soil” we simply tamped down the ground lightly with the end of a 4×4 post and then dumped out approximately two bags of crushed dust (sand) for each pad. Using a 16 inch long 2×4 as a screed we leveled the sand and then double check it with our 4 foot level. We also lightly tamped the sand down but not too much. The great thing about this sand is that it will not spread out flat like regular sand. It stays pretty much where you put it based on the fact that each grain of sand is course and “locks” together unlike regular sand that has formed from rock naturally wearing away. This sand is crushed. Hence the name “crusher dust”. Finally, we topped the level sand with our concrete pad and made certain all the pads were the same height. If any pad was too high we simply tamped it down further. If it was too low, we just lifted the pad and added a few more handfuls of sand. Hope that helps Wayne and thank you for the kind comments. Is this style of foundation safe for areas where earthquakes are a serious risk?I really like this style of foundation, but since it floats on the concrete pads could the whole building potentially fall off in a large quake? Thanks! Hey there Ben. I had this question come up a while back and someone who knows more than I do about earthquakes (we don’t have any here in Nova Scotia) sent me this link to help address a possible solution. While no “off-grid cabin” can be 100% quake-proof, I’d like to think you could improve upon what we’ve used in our construction by including additional structural supports like these here. Yes, I love your build I am in the process of building a 10×16 chicken coop and was looking for ideas for the foundation because where I am putting it there are a lot of tree roots and didn’t want to take the time and money to dig down 4ft and put in piers. I didn’t understand your build is a 20 x24 or 24x 20 and you are using 2x6x16 for your floor joists. Am I missing something? How are you spanning 20′ with a 16 foot floor joist? I have to be missing something. just wondering. thank You for your ideas your site has been very helpful. When facing the cabin from the front the inside floor space is 20ft wide and 16ft deep. The covered deck is also 20ft wide and it’s 6ft deep. So all in all our cabin has a total floor space of 20ft wide and 24ft deep. We used 16ft long 2×8’s quadruped up (nailed and glued) to make up the three main beams that support the floor joist. The pads are spaced 8ft apart and so we aren’t spanning the entire 20ft unsupported. These main beams run left to right and the floor joist built on top of these beams run front to back. To fashion the beams we overlapped the 2×8’s making sure to use construction adhesive and nails the full length of the beam. When we had two layers built we simply overlapped another row of 2×8’s and repeated the process until we had four layers. Hope that and the photos in the post make it clear exactly how we built it.